The BlackBerry Z30 is certainly not camera shy, having made a few appearances as of late. The phone, previously referred to as the A10 or Aristo, has now shown up in a new video online posted by Cellphone S. Although the speaker is talking in Vietnamese, it's nice to see the handset up close and in motion. The handset has a very HTC One look to it, and interestingly there's also an AT&T logo on the rear of the phone, suggesting this could be very near to at least its US release. This is either a brilliant or terrible time for the handset to make its biggest appearance yet, depending on how you look at it, given the news today that BlackBerry might be looking to sell up. The Z30 is believed to be arriving with a 720p resolution, 5-inch AMOLED display, and a dual-core Qualcomm Snapdragon S4 processor with 2GB of RAM. The phone is also said to have 16GB of storage and an 8-megapixel rear camera, and will ship with BlackBerry 10.2. 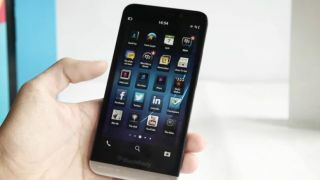 What do we think of BlackBerry 10?